"If You’re Kind and Polite, the World Will Be Right!" Paddington loves his life with the Browns. Everyone has changed a little bit from the last time moviegoers saw them all. Mr. Brown didn’t get the job promotion he thought he would, so Mrs. Brown has been supporting the family. Meanwhile, Jonathan and Judy have been growing up, which entails Jonathan trying to act cool, and Judy working on her new passion in writing by starting a newspaper. Paddington loves where he lives. Every morning when he leaves the house, he helps his neighbors get on their way to work. One day Paddington needs to find a gift for his Aunt Lucy, so he goes by his favorite antique store. The store has a beautiful pop-up book of London, which Paddington thinks is perfect for Aunt Lucy’s 100th Birthday. The storeowner tells him it’s a rare book, so it will cost a lot of money. Paddington doesn’t have the money, so he decides to work for it by doing little odd jobs. For a break, the whole family goes to the opening of the local circus fair. The fair is being opened by Phoenix Buchanan, an actor who has not done many big jobs recently. Phoenix asks if anyone wants to help him, and Paddington says he does and goes up on stage. Paddington tells Phoenix his wish is to get the pop-up book. The next day, Paddington goes to get the book after saving up a lot of money. He sees that the antique store is being robbed. He tries to stop the robber, but instead is taken by the police and accused of doing the job himself. Paddington is sent to prison, and the Browns must fight to find the real culprit and get Paddington freed. PADDINGTON 2 is an adorable, well made, entertaining movie filled with family fun. The quality is up to par with the first one, with a great script and high-quality set design. The acting and animation are also well done. PADDINGTON 2 has a strong moral worldview, with strong pro-capitalist elements and a strong warning against big government overreach. No matter what, Paddington tries to do the right thing, with the right attitude. He’s a fabulous character for children to see, because he’s always loving, compassionate, giving of himself, and super polite. The entire message is about loving your neighbor and seeing the good in everyone despite our flaws. Overall, MOVIEGUIDE® commends PADDINGTON 2 for the entire family. 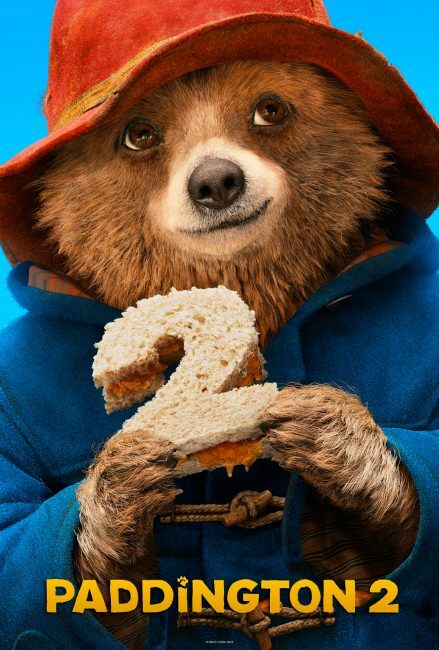 PADDINGTON 2 is a delightful sequel to the 2015 hit comedy. When Paddington the Bear is falsely accused of stealing, the Brown family has to solve the mystery and fight to get him out of jail. The story starts when Paddington finds a wonderful pop-up book about London for his Aunt Lucy’s 100th birthday. However, the book is expensive, so he decides to do odd jobs around the neighborhood to earn the money. Then, when the book is stolen, Paddington is mistaken for the thief. The Browns now have to find out who stole the book to free Paddington. PADDINGTON 2 is an adorable, entertaining movie filled with family fun. It has a great script, with wonderful acting and animation. PADDINGTON 2 has a strong moral worldview, with strong pro-capitalist elements. No matter what, Paddington tries to do the right thing, with the right attitude. He is a fabulous character for children to see, because he’s always loving, compassionate, giving of himself, and super polite. The entire message is about loving your neighbor and seeing the good in everyone. MOVIEGUIDE® commends PADDINGTON 2 for the entire family.